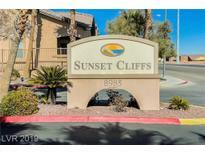 Below you can view all the condos for sale in the Sunset Cliffs subdivision located in Las Vegas Nevada. Listings in Sunset Cliffs are updated daily from data we receive from the Las Vegas multiple listing service. To learn more about any of these condos or to receive custom notifications when a new property is listed for sale in Sunset Cliffs, give us a call at 702-323-5991. All Building Exteriors are being painted. Building #44 was just finished. MLS#2087757. Painted Desert Realty. The community offers two pools, a spa and clubhouse. This is a must see! MLS#2081550. Realty ONE Group, Inc.
All Furniture Is Negotiable Outside Escrow. MLS#2080687. Resolution Realty. Located in gated community with pool, spa, fitness center, and more. MLS#2078550. Xpand Realty & Property Manage. The community consists of two pools, upscale clubhouse and a state of the art exercise room. WELCOME HOME! MLS#2078380. BHHS Nevada Properties. Gated community with pool, spa, and park area, must see to appreciate...... MLS#2073901. Century 21 Americana. Each bedroom have access to own, separate, spacious bathrooms with double vanities. MLS#2071716. RX Realty. 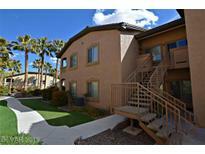 Community has pool, spa, BBQ area, fitness center, & more! Must see! MLS#2062809. Dg Realty.